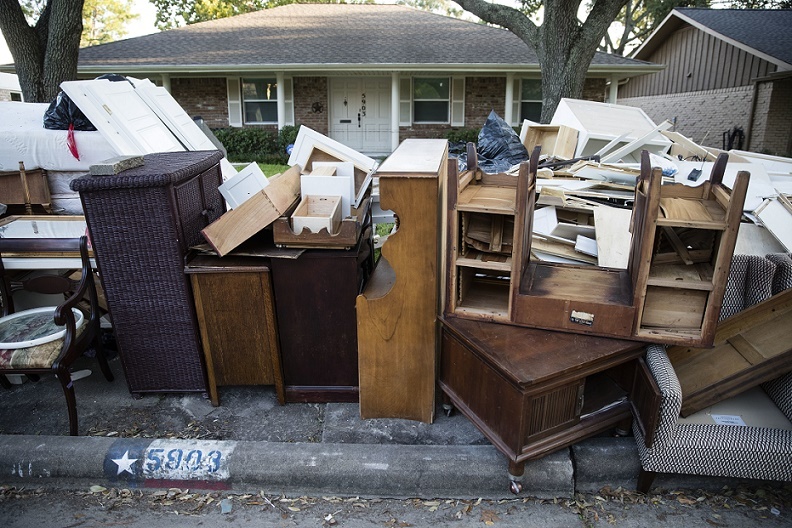 HOUSTON (CN) – With Houston facing the monumental task of disposing debris from flood-ravaged homes, tempers flared at Wednesday’s City Council meeting when a council member asked city staff to give him a schedule for when trash will be picked up in his district. The materials tossed from flooded homes—flooring, furniture, cabinets and drywall—stand 10 feet tall on the curbs in front of every house in some subdivisions, post-apocalyptic swaths amid neighborhoods that suffered no flood damage. Houston Mayor Sylvester Turner said Wednesday there are 8 million cubic yards of debris on the city’s streets – by some estimates enough to fill the Houston Texans’ football stadium two times – and the city had picked up 400,000 cubic yards as of Tuesday night. He said the city has 300 city and contractor trucks working now, and the goal is to increase the trucks to 500 and pick up the debris within three months and dispose of most of it before Thanksgiving. Hurricane Harvey paralyzed the eight-county Houston region, which is larger than New Jersey, over four days in late August, dumping 51 inches of rain in some parts of the area and flooding more than 125,000 homes. Last week, Mayor Turner unveiled a proposal to increase property taxes by 8.9 percent for one year starting in January 2018 to raise $113 million. Turner said the tax revenue was needed to pay for trash-removal contractors, replace 334 emergency vehicles that Harvey flooded, reimburse $20 million spent on Harvey relief that was taken from an emergency fund, and repair two sewage treatment plants and a water-purification plant. But Turner said at Wednesday’s City Council meeting that he will decrease the proposed tax hike because the Federal Emergency Management Agency has agreed to increase its reimbursement rate to 90 percent for many of the city’s Harvey-caused expenses. FEMA has already agreed to cover 90 percent of the city’s debris-removal costs, which Turner estimates will be about $25.9 million. “My request on a tax rate increase is pretty much cut almost in half. What we are seeking now is the $25 million match for debris removal and the restoration of the $20 million in the economic stabilization fund because there will be another storm or some emergency of some kind,” Turner said, peering over the glasses on the bridge of his nose. He said the City Council’s vote on the tax increase is still set for Oct. 18. Turner said that because Hurricane Irma tore up Florida days after Harvey dumped on Houston, many trash-disposal contractors have gone to Florida in search of better pay than the $11.69 per cubic yard of debris that Houston is offering. FEMA initially agreed to reimburse Houston for its trash contractors at $7.69 per cubic yard, but it increased the rate to $11.69. Turner said he will stick with that rate to curtail the city’s costs, but it will slow the process down. “I talked to another large contractor yesterday, trying to bring them on board and they flew in. What they said to me is, ‘Mayor, $11.69 isn’t going to cut it, you have to be in the upper teens, in order to bring us or we’re not going to do it,” Turner said. The City Council went into Wednesday’s meeting with the expectation they would approve a $60 million payment to DRC Emergency Services for storm debris pickup. DRC was under contract to remove storm debris for the city before Harvey arrived. But the proceedings became contentious when the issue came up for a vote. Vice Mayor Pro-Tem Jerry Davis questioned how much of the $60 million DRC would pay its subcontractors, who are the ones running the garbage trucks and excavators filling them, and whether the city could hire subcontractors itself without going through DRC. Turner clenched his jaw and his voice tightened as he responded to Davis. “They [DRC] were not able to bring on subcontractors at all with $7.69, FEMA allowed us to increase the amount for our procurement contractors,” Turner said. “For back work?” Davis asked. “And for work that will take place. If you don’t appropriate the $60 million then essentially you’re slowing down the debris removal,” Turner said. City Council members say their constituents are bombarding them with emails and telephone calls asking when the debris will be removed from their streets, and the stress was palpable in one of them at Wednesday’s meeting. “Is that it for you, council member? Does that do it?” Turner asked Green. “No, I asked a question,” Green said. “I heard you and I’ll do my best to respond to you. Is there anything else?” Turner asked. “All right, with that I will tag the item,” Green said, referring to a procedural move that delays a vote on an agenda item for one week. “If you tag it, if you tag it, council member, you’re going to slow down the debris removal. So are you tagging it?” Turner said, setting Green off.